Today, a powerful new Popcorn Maker demo makes its debut on TED.com, showcasing Popcorn’s potential to change the way the world tells stories on the web. Mozilla Chief Operating Officer, Ryan Merkley, presented Popcorn Maker with a live demo at TED Global in Edinburgh on June 29. 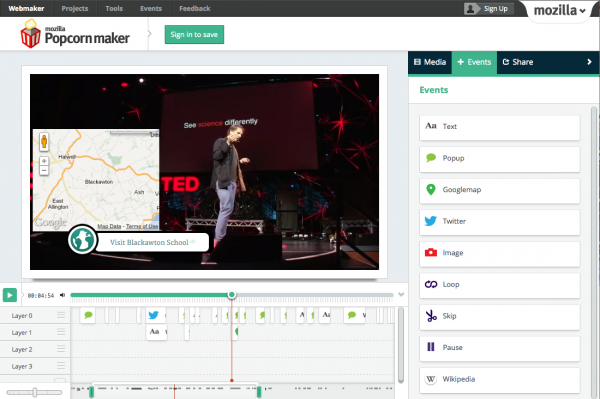 The online tool, developed as part of Mozilla’s Webmaker program, makes it easy for anyone to add live content to any video — photos, maps, social media feeds and more. Mozilla is also experimenting with TED Talks in other ways. Today the Popcorn team released this remix of a TED Talk from Dr. Beau Lotto, adding a clickable layer of information that anyone can add to, edit or remix. In November, Mozilla will launch Popcorn Maker 1.0 at the Mozilla Festival in London, UK. In the mean time, we’re making this new beta version available for testing to coincide with today’s TED talk launch. While the team is still polishing the final release, this beta is fully functional and ready for anyone eager for a first look. Watch the TED talk. It’s now live on TED.com, and on You Tube. Check it out! Get a taste of Popcorn in action. 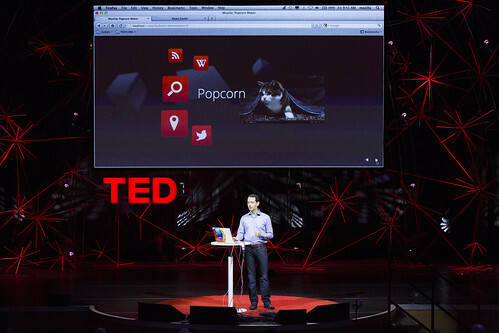 We’ve remixed a TED talk using Popcorn Maker to show how easy it can be to make your own interactive video. Try out the Popcorn Maker beta. Make your own video today, and tell us what you think. Popcorn Maker has been built by many Mozillians, including the contributor community for the Popcorn.js framework that powers the tool, talented team-members like Bobby Richter, Jon Buckley, Kate Hudson, Scott Downe and Ben Moskowitz, and Mozilla’s unique partnership with Toronto’s Seneca College. Popcorn Maker would be impossible without students Christopher de Cairos, Matthew Schranz and David Seifreid, led by instructor David Humphrey.